You recognize that you have a problem and that you need the help of a licensed psychologist. Deciding to see a therapist is an important decision and the first step to finding help. Next, you begin the search for a qualified and experienced professional. Ask your family and friends, your doctor, or ask at your church or synagogue for recommendations. You can also call your local psychological association or look online at the American Psychological Association’s psychologist locator. Most important is finding a psychologist with whom you feel comfortable. You want to feel at ease talking about personal and emotional problems in a safe space. Importantly, all your interactions with your therapist are confidential. Dr. Angela Bisignano is a licensed clinical psychologist with degrees from UCLA, Pepperdine University and Fielding Graduate University. She is accredited by the American Psychological Association (APA), an active member of the California and Los Angeles County psychological associations, contributor to respected psychology journals, and the author of “Beautifully Gifted.” Dr. Bisignano has been helping people throughout Southern California for more than 20 years and has many successful patient stories. Her specialties with individuals include anxiety and stress, depression, and relationship issues. In the following interview with Dr. Bisignano, she explains the what to expect in your first therapy session. What is the format of the first therapy session? My first introduction with a potential client is a phone consultation. I schedule a time to have a complimentary phone conversation. I ask questions about the reason someone may be coming into therapy at this time. I generally ask a little bit about the nature of the presenting problem. For example, if you are struggling with anxiety, I may ask what your symptoms are. Or how long have you been struggling with anxiety. If at the end of our phone conversation I feel like I can help you, I will invite you to set up our first session in my office. This is called an intake session. What is involved in the first therapy session? In general, the first therapy session, or the intake serves as an introduction to your psychologist. This initial session provides you with a sense of whether you think this person could be a good fit for you. Is rapport established? Do you feel like you can trust this person with your problems or emotional difficulties? Do you feel respected? Safe? If you can answer yes to these questions following your first meeting, then this could be a good fit. I also give people an opportunity to ask me questions. At the end of our time together, I will make a determination if I feel like I can help you. If I assess that I can, and we together feel it is a good therapeutic fit, we schedule our next session. In the next session or two, I will formulate a treatment plan and we will review it together. The treatment plan serves as a guide for our work together. What do I talk about in my first therapy session? I try and put people at ease in the initial session. It can be intimidating to open up to a complete stranger. I tell people what they can expect in our first session. I go over confidentiality and the limits of confidentiality. 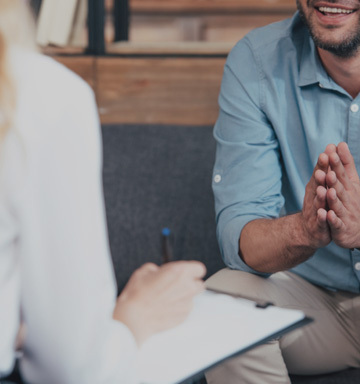 Some people feel comfortable sharing why they are coming into therapy and know exactly what they are hoping to get out of therapy. Others aren’t sure of the process or how therapy might help. Perhaps they have never been to therapy before. In the first session we discuss the reason for therapy. I also ask questions about people’s family, their background, relationship history, and other pertinent information that will help me to understand how I might best be able to help. What experience do you have in helping people who have problems like mine? My specialties with individual therapy include relationship issues, anxiety, stress management, and mild to moderate depression. I have worked with hundreds of people over the years. Many therapists have a wide array of issues they work with. I focus in very specific areas. I am a relationship expert. I believe we have a strong desire to feel connected, valued, and loved. Everything we do in some way is affiliated with relationships, beginning with our most primary relationships with mom and dad. How we learned how to love and engage with others is influenced by people in our lives. I believe optimal health and wellbeing is directly related to the quality of the relationships in our lives. I have also conducted research on stress and anxiety at Harbor-UCLA Medical Center. My research has been published in psychological journals. Anxiety is an area I am also an expert in. Not only from a researcher’s perspective, but also as someone who has had personal experience with learning how to manage my own stress and anxiety. Learning evidenced based skills and strategies that I have found effective helps me to offer hope to those I work with. What kinds of treatments do you offer and how can they help me with my problems? My approach to working with anxiety and depression is primarily influenced by Cognitive Behavioral Therapy. I use evidence-based approaches in my work. We know from research that one of the best ways to treat anxiety and depression is using Cognitive Behavioral Therapy. My approach to working with anxiety and depression is also influenced by Attachment Theory and Interpersonal Neuropsychology. I utilize a comprehensive biopsychosocial-spiritual model in my therapeutic work. I believe God created us as complex beings. Mental health includes looking at all of these domains for optimal well-being. How long does therapy take and what can I expect? Sometimes people ask me how long therapy will last. This depends on the issues or problems presented. It also involves a person’s motivation. Generally, people will meet with me once a week for about 45 to 50 minutes. If you are committed to the therapeutic process and practice skills and strategies to help reduce or manage symptoms related to stress, anxiety or depression you will most likely experience a reduction of symptoms, increase in positive mood and wellbeing, and feel more hopeful.